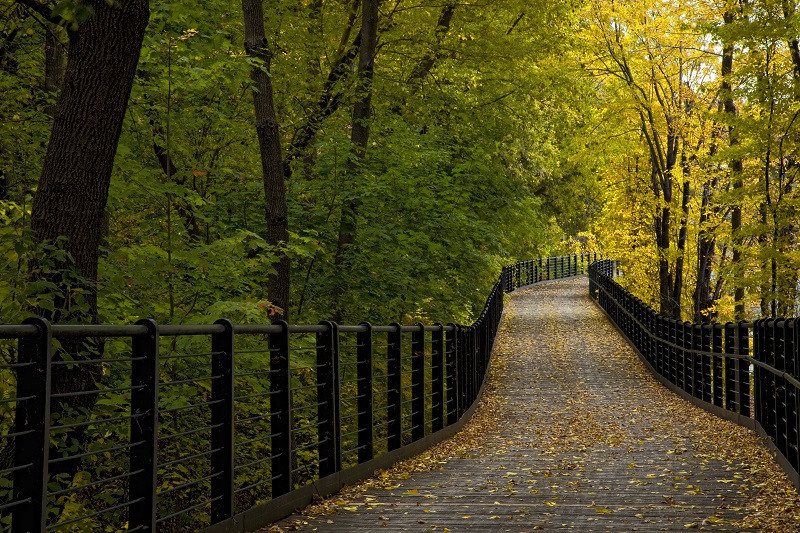 This panel discussion will engage audiences on the importance of urban trees, by presenting the findings of a tree canopy assessment completed in the National Capital Region, as well as new perspectives from other regions. The NCC invites you to a workshop to discuss the future of the Capital Pathway, and participate in the review of the vision and strategic directions for this exceptional multi-use network. During this exercise, you will have an opportunity to discuss some of the following themes and explore possible solutions to the issues raised. Join us for this discussion, and help shape the future of the Capital Pathway. Reserve early. Space is limited. Please register by noon on February 19, 2018. From Councillor Jeff Leiper on Official Plan amendment for Rochester Field. Disappointingly, City planning staff have recommended that Council approve a zoning and Official Plan amendment for Rochester Field that would see future development in the park along Richmond Road. I’ve attached a copy of the staff report below that will be published next week for the agenda of the January 23 Planning Committee. Since it was originally shown at the open house, there have been greater setbacks introduced to better protect the mature trees on the southern edge of the site, as well more space to the homes on Fraser. Otherwise, the plan is essentially the same. That means that there is no “green corridor” linking Richmond to the SJAM park as was contemplated in the original agreement between the City and NCC. My objections to this proposal remain as I set them out in a blog post on November 19. Below, I’ve pasted my comments that appear in the staff report. I reached out after the open house to the Mayor to seek his help in bringing the NCC back to the table, given his strong language at the NCC board meeting at which this was discussed, but I am uncertain as to his current position. Further, I am still hopeful that our MP and Minister of the Environment Catherine McKenna can be prevailed upon to raise this at the Cabinet level. At the end of the day, the decision to eventually develop this land is the NCC’s. I and residents are baffled that they would even contemplate this. The timing by the NCC for proceeding with this is driven by its redevelopment plan for the SJAM linear park, which is tied to LRT construction. I understand that they want certainty about where they will be able to build their park, and what’s out-of-bounds. There is no actual development proposal for the property, and even if this is passed by Council we will still have time to lobby the NCC and federal government to abandon this scheme It is simply disappointing that the City might be complicit in its progression, however. I want to note that there has been a good discussion about whether the portion retained for open space parkland should be left relatively untouched, or whether it should be more manicured. I have my personal preference, but this was a matter of consultation by the NCC with residents, and it is their land. 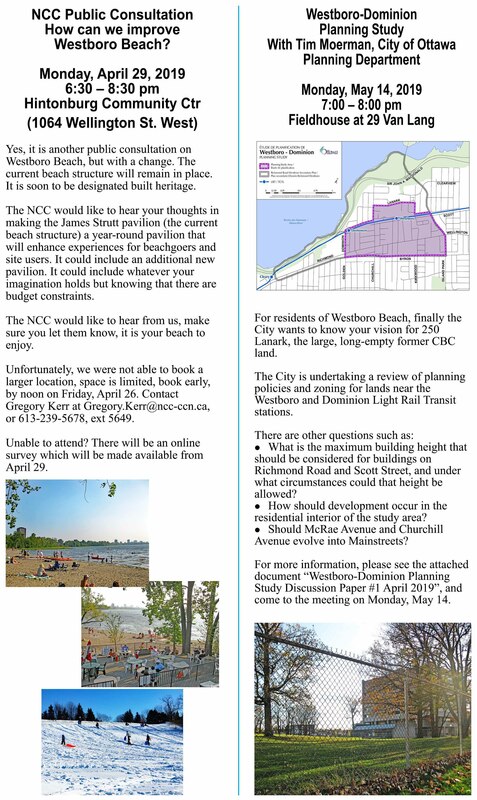 I know some residents will be uncomfortable with the level of programmed space, but that is the NCC’s decision and it will be accountable for it. I will trust that they are implementing, after a good consultation, what they heard a majority of residents want. And, I want to be fair in recognizing that the NCC has proposed a much smaller amount of development than the original agreement would allow. The original deal would see 2/3 of the site permitted to be developed. They are now proposing that 80% would be park. I believe we can do better, particularly with respect to the link between the River and Richmond, but that won’t be possible unless Council forces the NCC back to the table by rejecting this Official Plan amendment. My strong encouragement to residents is to come out on January 23 to speak to Planning Committee about your concerns. There’s more details about how to do that in the attached document. For over a century, Rochester Field has been a jewel in Westboro. If a plan being rushed forward through City zoning by the National Capital Commission (NCC) proceeds, we’ll lose the best parts of it forever. It’s time to take a second look. Rochester Field is a large NCC parcel that straddles the land from the Sir John A. Macdonald Parkway to Richmond Road. It is a barely maintained space. Through the years, cow paths have been worn along natural desire lines as dog-walkers and people walking to the Dominion transit station have used the field, while the rest of it has lain largely fallow as habitat for various flora and fauna. It is a network connection in our City’s greenspace between our Byron Linear park (soon to be revitalized) and the Sir John A. Macdonald park. It is a large, natural park space in Kitchissippi ward where greenspace is at a premium. Intensification in this part of the city has been rapid. Small homes on large lots are now being replaced with large homes on small lots as infill continues. We are losing permeable, green surface and trees both to infill and the proliferation of towers. Targets for intensification are being met in our ward as nowhere else in the city, and the effect on greenspace is increasingly obvious. The opportunity we have is to preserve a large piece of greenspace for the enjoyment of future generations of residents. When the City previously proposed not to allow development on the site, it was working in residents’ interest over NCC objections. The development now being proposed as part of an agreement forged during the dispute over whether and under what conditions the City could run the Confederation Line through the NCC’s land in this corridor. Council was told specifically that the deal would retain a green corridor from Richmond Road to the SJAM. In 2015, the City and NCC began to implement that agreement, but that process was put on hold while the NCC consulted about its larger park plan for the corridor. In the intervening months, that has become a plan that would cluster development along Richmond Road – six-to-eight story buildings that would hide the park behind mixed-use developments that will cut off forever the green corridor we were promised. In the plan moving forward quickly through the approvals process, the greenspace won’t be in the northeast at all. Residents are wondering whether and how the City could allow this to happen. It’s time to press pause on the process. There is some legitimacy to the NCC’s arguments that it needs certainty with respect to where it can build its proposed park. The LRT agreement includes $30 million in City contribution to that, and the works will be bundled in with rail work to the benefit of taxpayers. It is in everyone’s interest that the NCC receive the certainty is needs. But the long-term impacts of approving this plan, which clusters development in diametrically opposite the space where it was to have gone in the original deal, are too consequential to bludgeon through the City’s processes. There are alternatives that would mitigate the impact of development in this parcel, if development is to occur at all. Residents, the NCC and the City are all owed the time to explore those. Council is bound to honour its commitments in return for the city-building benefits of moving ahead with light rail. But its commitments were clearly spelled out in black and white: we are under neither legal nor moral obligation to approve zoning which meets neither the spirit nor letter of our pledge. As part of its emerald ash borer management strategy, the National Capital Commission (NCC) will be removing ash trees affected by the emerald ash borer along the Sir John A. Macdonald Parkway close to Island Park Drive. The work will take place from January 15 to 19, 2018, and will be undertaken between 7 am and 5 pm, weather permitting. The work will not require any closures, as the contractor will have personnel on-site directing people around the work zone, as required. Users should respect the signage installed at pathway entry points. If you have any questions, please do not hesitate to contact the NCC’s client services at 613-239-5000 or info@ncc-ccn.ca. For more details on the emerald ash borer management program, please visit our website. We thank you for your understanding, and invite you to share this message with the members of your community. Dans le cadre de sa stratégie de gestion de l’agrile du frêne, la Commission de la capitale nationale (CCN) coupera des frênes atteints par cette maladie le long de la promenade Sir-John-A.-Macdonald à proximité de la promenade Island Park. Les travaux se dérouleront du 15 au 18 janvier 2018, entre 7 h et 17 h, si la météo le permet. Ils ne nécessiteront aucune fermeture, puisque l’entrepreneur aura du personnel sur place pour diriger les gens près de la zone des travaux, au besoin. Les usagers sont priés de respecter les panneaux de signalisation qui seront installés aux différents départs de sentiers. Si vous avez des questions, n’hésitez pas à communiquer avec le service à la clientèle de la CCN au 613-239-5000 ou à info@ncc-ccn.ca. Pour plus de renseignements concernant le programme de gestion de l’agrile du frêne, veuillez consulter notre site Web. Nous vous remercions de votre compréhension et vous invitons à transmettre ce message aux résidants de votre quartier. This is to advise you that the above‑noted matter will be considered by the City of Ottawa Planning Committee on Tuesday, January 23, 2018. Attached is a copy of the report outlining the Departmental recommendation. For more information, please contact Bruce Finlay at extension 21850. La présente vise à vous informer que le Comité de l’urbanisme de la Ville d’Ottawa étudiera l’article cité sous rubrique le mardi 23 janvier 2018. Veuillez trouver ci‑joint une copie du rapport comprenant la recommandation du Service. Pour plus d’information svp communiquer avec Bruce Finlay au poste 21850.